March 2019 Fretboard Journal features an interview with and performance by guitarist extraordinaire Adam Miller. There’s a great video of him playing his composition “Habit” of Ken’s Lucky. There’s also a Fretboard Journal Podcast where Adam talks about Lucky as well as all things guitar. Just a wonderful performance! Fretboard Journal # 38, with Leo Kottke on the cover, features the first of a two-part article about Ken. Be sure to pick it up at your local guitar store, book store, or what the heck, they've got great deals on subscriptions, so you don't even need to leave your house! While you'll have to buy the magazine to read the articles, you CAN listen to a podcast Fretboard Journal has featuring an interview with Ken. The audio is a little rough, but the content makes it worth the effort. Just click on the image above. Check out the August 2011 for a GREAT arcticle on Ken, his history, his guitars and his vision. Just click on the preview to read. The New Yorker magazine featured an extensive review of Ken's career as well as a most interesting overview of his current work and philosophy in its May 14th issue. It's a fascinating read and is sure to surprise even the most ardent Kenophiles. Click the illustrated image to download the article. On the heels of Ken's visits to Europe this year (2016), comes this wonderful story of the a meeting at one of the events and its meaning to the author of this article. The December 2009 ToneQuest Report has a GREAT article on Ken. They've graciously allowed us to share it with you. If you are seriously into your guitar and its tone, we strongly encourage you to subscribe to the ToneQuest Report. Click here to subscribe. And click here to read the ToneQuest Report article on Ken! 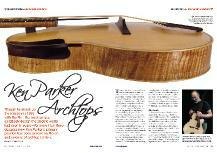 Ken's article/interview is available in the January 2009 issue of Acoustic Guitar Magazine. Read the article here. Dave Stephens visited Ken last year and published a great article in Just Jazz Guitar magazine. It was in the November 2007 issue and can be downloaded here.